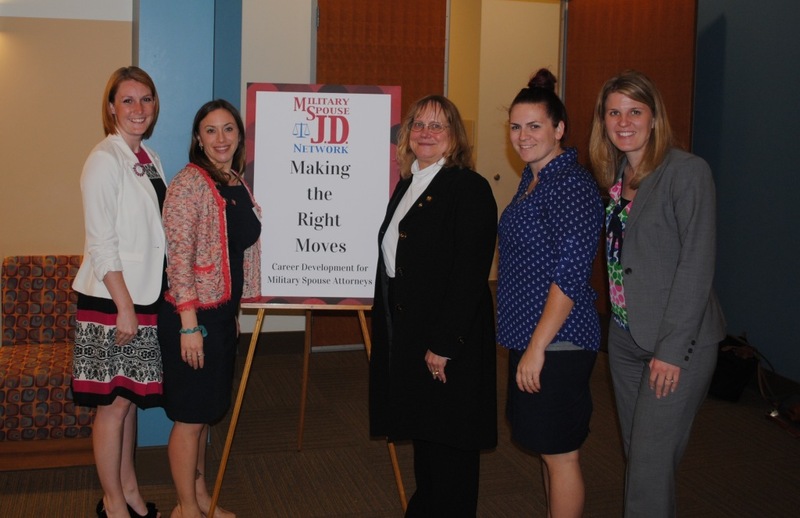 On October 17th, the Military Spouse JD Network (MSJDN) held its 2nd annual “Making the Right Moves” Conference at Thomas Jefferson School of Law (TJ SL). Military spouses from across the country gathered in San Diego for the first national MSJDN event on the West Coast. The day was full of connections and celebration for professional military spouses and community supporters. 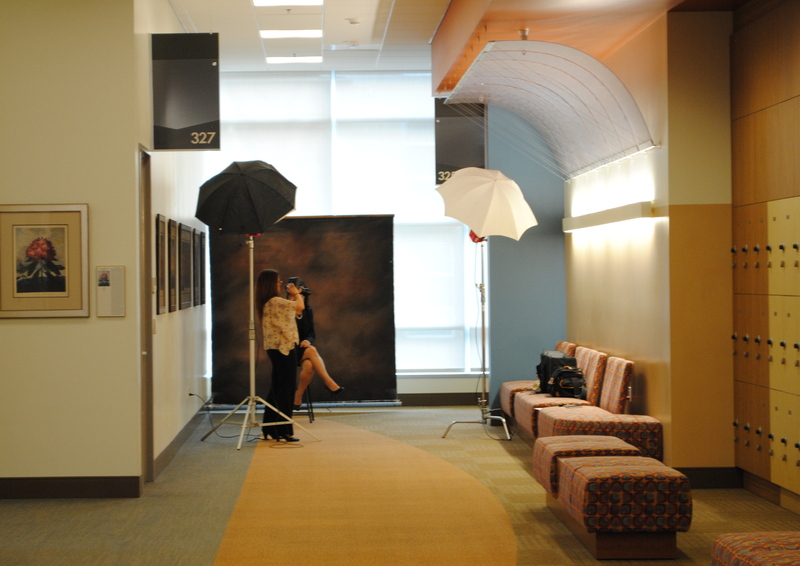 Attendees were treated to an agenda packed with education and advice from distinguished speakers, as well as resume review by career advisors from local law schools and professional head-shots donated by photographer Jamie Colin. TJSL Dean Thomas Gu ernsey opened the event with remarks focused on leadership and recognized MSJDN members Elizabeth Jamison and Michelle Mance in his comments on leading and succeeding even when obstacles like deployments and PCSing frustrate plans and goals. The first panel of the day included legal recruiter and attorney Barrett Avigdor from Major, Lindsey and Africa and employment specialist Lana Massimini with Marine Corps Community Services at Camp Pendleton. Moderated by MSJDN President Rachel Winkler, the panelists provided attendees with advice about preparing and utilizing an opening pitch. Attendees asked questions and received guidance about when to disclose to military spouse status to potential employers. 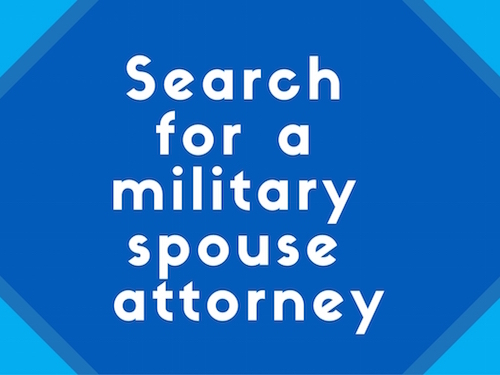 Barrett Avigdor supported including military spouse status on a resumé, saying otherwise applicants might not make it to the interview to address a potential employer’s concerns about gaps or frequent job changes. MSJDN’s Membership Chair Lindsey Savage moderated the second panel of experts in the morning session. TJSL Professor and MSJDN member Amy Day, attorney Andrew Woodmansee, and In Gear Career co-founder Donna Huneycutt offered strategies for building a successful career path. 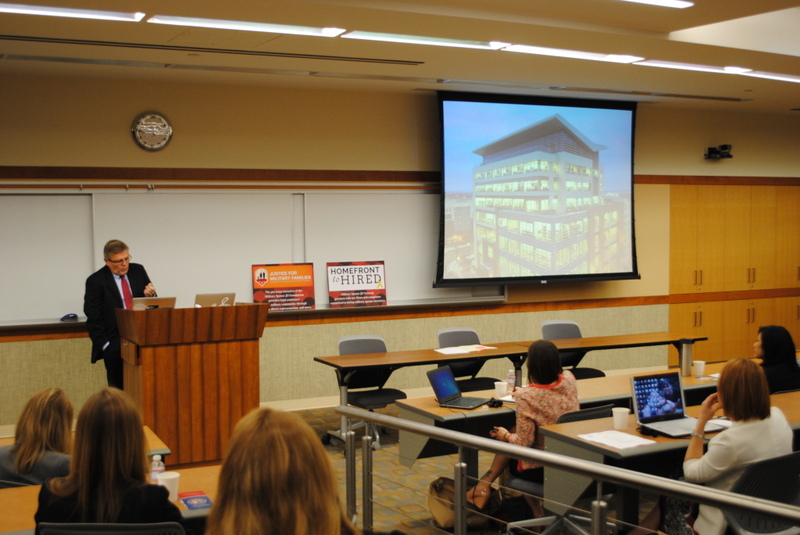 Director of TJSL’s Center for the Study of Women and the Military, Professor Day acknowledged the hurdles faced by military spouse attorneys, but encouraged attendees to use each PCS as an opportunity to re-assess both personal and professional goals. Attendees were then treated to a frank discussion with Assemblywoman Lorena Gonzalez, who advised the ambitious group to prioritize, saying, “You can’t do everything you set your mind to, but you can do anything you set your mind to!” Coronado Mayor Casey Tanaka later addressed the group and urged attendees to be proactive in seeking solutions to problems at all levels. He recognized the sacrifice of military families and encouraged military spouses to get involved in the political process to engage the sense of service so common in military families. The morning session wrapped up with a “Grit Project” panel. Ms. JD President Katie Larkin-Wong and American Bar Association’s (ABA) Commission on Women representative Teresa Beck joined MSJDN Governance Director Reda Hicks to explore the ABA’s program that educates lawyers about the science behind grit and growth mindset – two important traits that many successful women lawyers have in common. A rousing discussion of the topic, including military spouse traits of determination and resiliency, closed out the morning. 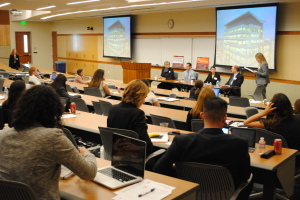 Community members, including representatives from the San Diego County Bar Association, the Veterans Bar Association, and local firms and businesses, joined attendees in the stunning boardroom on the top floor of the law school for lunch and networking. 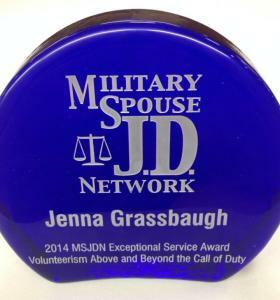 During the luncheon, MSJDN President Rachel Winkler presented the Exceptional Service Award to MSJDN member and U.S. Army Judge Advocate Jenna Grassbaugh. Although Capt. Grassbaugh could not be in attendance, luncheon attendees were moved by her story of sacrifice and honored her service. Following lunch, attendees reconvened for a panel led by Reda Hicks exploring the importance of state and local networking opportunities and getting to know community leaders. Alisa Reinhardt from the San Diego Regional Chamber of Commerce, Renee Galente of Galente Ganci and California Women Lawyers, and Joe Buehrle with the San Diego Military Family Collaborative talked about creating and utilizing a supportive network that extends across states and duty stations so that military spouses can leverage connections wherever they may be located. The next panel, led by Lindsey Savage, explored how military spouses can strategically strengthen their resumes while simultaneously serving the local community. Veterans Legal Clinic Director Steve Berenson, Parisa Ijadi-Maghsoodi from San Diego Volunteer Lawyers Program, Deputy Public Defender Steve Binder, and Theresa Mesa with the State B ar of California Office of Legal Services discussed ways attorneys can gain career experience and fill employment gaps on the resume through volunteerism. Parisa Ijadi-Maghsoodi and Theresa Mesa both stressed that volunteer work can always be found to fit your skills and availability, whether you are working full-time or unemployed. Even a few hours at a legal clinic can help build skills and connections. The final panels of the day discussed paths for military spouses to serve in the political ranks or from the bench. 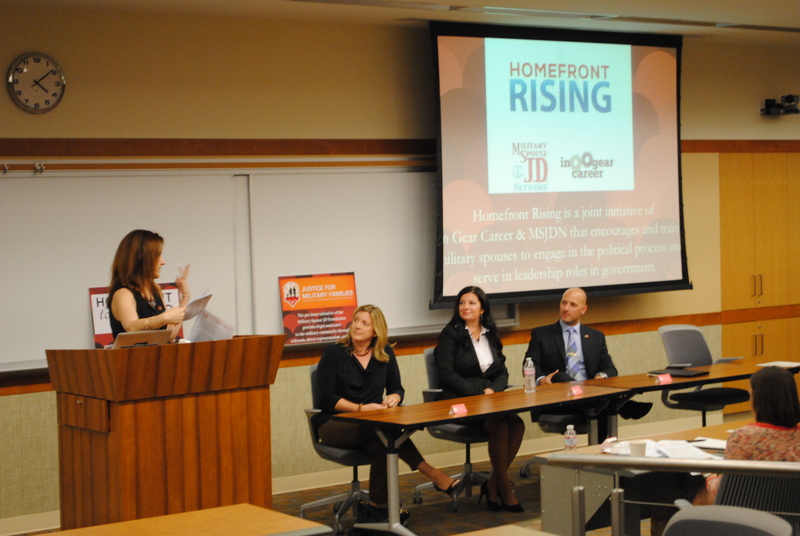 Homefront Rising co-founder Donna Huneycutt led seasoned political veteran Mindy Fletcher and the husband and wife political team of Michael and Alexandra Garrison in a discussion of how military spouses can pursue positions of influence on the local, state, and national levels. Mindy Fletcher, an advocate for foster children, talked about finding your passion, saying it is easy to convince others to believe in you when you are confident in your own beliefs. The Pathway to the Bench panel, led by Rachel Winkler, began with Janice Mulligan from the California Judicial Nominations Evaluations Committee explaining the application process for judicial candidates in the state. U.S. Magistrate Judge William Gallo joined in the conversation, sharing the story of how he inadvertently became a judge and offering advice on building connections and experience in a way that could lead to service on the bench. MSJDN members thoroughly enjoyed the conference. Michelle Mance, a 3L at TJSL and Navy spouse, said it was the best conference she has ever attended because of the releva nt topics and meaningful advice tailored for professional milspouses. 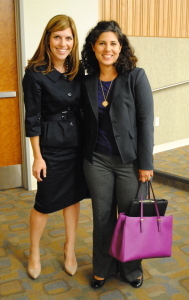 Stephanie Halford, also a Navy spouse, said, “Having the opportunity to meet such amazing women at MRM was incredible. I can’t wait to implement some of the suggestions of the panelists and other members.” Unemployed at the time of the conference, Stephanie is now working at Gordon & Rees in San Diego after making a connection at the MRM luncheon! Making the Right Moves 2014 continued the MSJDN tradition of excellent education and meaningful connections. Join us again next year to connect and celebrate!